When the seat of the Roman Empire moved to Byzantium, a new style became the official architecture of the church.Plans were based on a Greek cross, with a large cupola rising from the center and smaller ones crowning the four small arms. The style was characterized by large domes supported on pendentives, circular or horseshoe arches, elaborate columns and richness in decorative elements. Doorways were square-headed with a semicircular arch over the flat lintel. The round arch, segmented dome, extensive use of marble veneer and rich frescoes with colored glass mosaics are also characteristic of this style. The most well-known examples are the Hagia Sophia in Istanbul, and St. Marks (illus. ), in Venice, Italy. The architecture of the Byzantine or Eastern Roman Empire which developed from Early Christian and late Roman antecedents in the 4th cent., flourished principally in Greece, but spread widely and lasted throughout the Middle Ages until the fall of Constantinople to the Turks (1453). It is characterized by large pendentive-supported domes, round arches and elaborate columns, richness in decorative elements, and color. The most famous example is the Hagia Sophia in Istanbul (532–537). Research interests include; Cappadocia, Byzantine architecture, rock-cut architecture, medieval domestic architecture and medieval settlements. Students of Curcic, a Serbian scholar of Byzantine art and architecture, now in the US, present 14 essays on aspects of Byzantine architecture inspired by his own interests and contributions. We sought longevity and beauty with a dip at the stunning Baths of Aphrodite, marvelled at the rare Byzantine architecture and paintings at the Ayios Neofytos Monastery, and stepped back in time with a visit to the ruins of the ancient house of Greek goddess Dionysos. The notion of the building as a numinous instrument was continued in descendants of Byzantine architecture as different as Gothic churches of the North and Ottoman mosques in the Middle East. With its comparatively massive size, cobalt blue color, Byzantine architecture, and three statues on the crown, the structure is hard for passersby to miss. Guide books tell us the church is the world's finest example of neo-Romanesque Byzantine architecture. They are, I like to hope, beginning to see that the hidden constitution, with its elaborate rules of etiquette and its byzantine architecture of pretense and its elaborate hierarchies of respectability, is much like the written constitution: It restricts us so we can be free. Where some of the key building projects were for churches, Byzantine architecture might have been considered a useful bridge to the east. The piazza is surrounded by the same designer boutiques you'd find on Rodeo Drive in Beverly Hills, plus you've got a grand view of the San Marco Basilica, a stunning example of Byzantine architecture, decorated with huge horse statues on the exterior and painted ceilings on the inside. 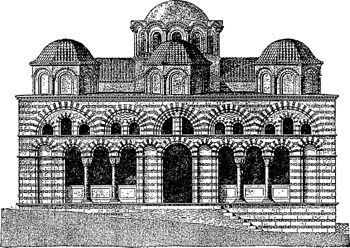 Years earlier, he had studied Byzantine architecture. Saint Sophia at Constantinople and Saint Mark's at Venice are fine exemplars of Byzantine architecture and decoration. Its "mosaic-city blend" of Hellenistic-Roman and Byzantine architecture includes the aisles and soaring arches of remarkably well-preserved sixth- and seventh-century churches.